WASHINGTON — As NASA reopens after the longest government shutdown in history, the agency’s administrator said Jan. 29 that a full recovery from the effects of the shutdown will take longer than the shutdown itself. 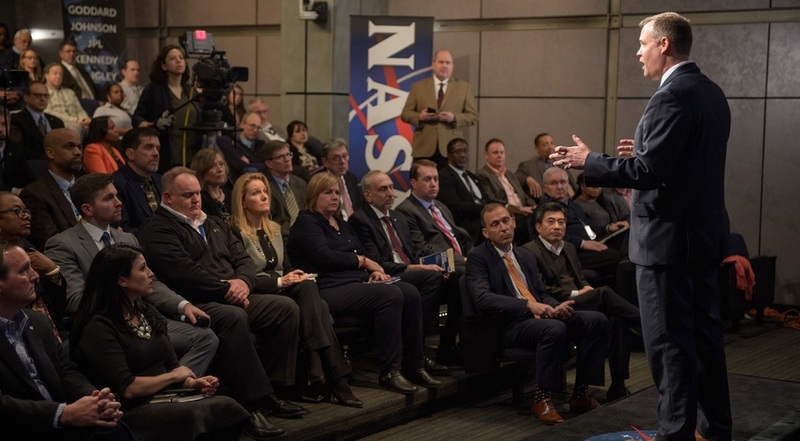 In a town hall meeting at NASA Headquarters that was broadcast to the agency’s field centers on NASA Television, NASA Administrator Jim Bridenstine welcomed back the agency’s workforce after a 35-day shutdown that furloughed the vast majority of them. The event focused primarily on issues facing the NASA workforce, rather than the effects the shutdown had on agency programs. One of the first priorities once the shutdown ended late Jan. 25 was to handle back pay for the agency’s civil servant workforce. Bridenstine said the office of NASA’s chief financial officer worked over the weekend to make those arrangements. Agency employees should receive that back pay this week. During the town hall, one employee asked if NASA civil servants could contribute to crowdfunding efforts on platforms like GoFundMe to assist contractors. Doing so, agency officials said, poses potential legal problems. “The problem with the GoFundMe idea and the campaigns is that you run into conflicts,” said Bob Gibbs, chief human capital officer. “When you’re dealing with contractors and federal employees, you don’t know who is contributing to whom and how that all works.” Neither he nor Sumara M. Thompson-King, the NASA general counsel, gave a clear-cut answer if such donations were permitted or prohibited, referring instead to a statement posted online last week about such donations. Payroll is not the only area where NASA is working to catch up from the shutdown. The agency’s cybersecurity program “in the most part was fully functional” during the shutdown, said Renee Wynn, NASA’s chief information officer. That included pushing out the most critical software patches, she said, although lower priority patches were held back until after the shutdown ended. Wynn added that about 35 websites across NASA were taken offline during the shutdown because of issues like the expiration of security certificates. Those sites, which did not include the main NASA public website, are now being brought online. Fully recovering from the shutdown will take weeks, Bridenstine said. There was no “mass exodus” of employees from agency during the shutdown, but a handful of people at both NASA Headquarters and the field centers left during the shutdown, and contractors were in some cases reassigned by their employers and may no longer be available to work for NASA. Bridenstine said he recalled that the last lengthy shutdown, which closed NASA for nearly three weeks in October 2013, took a lot longer than three weeks to recover from. That was a source of frustration for him, at the time a member of Congress. “Why does it take longer to get back into order after a shutdown?” he asked. “We won’t really know the true impact for probably some period of time on what [the shutdown] did to the workforce,” Gibbs added. With the shutdown now over at least temporarily — NASA and other agencies that were shut down are funded only through Feb. 15, pending a long-term deal in Congress — Bridenstine tried to focus on the year ahead, including showing a video of many of the activities the agency will be working on in 2019.